Standard in white, Jot incorporates ultra-thin, ultra-durable Diamalite glass with a magnetic interlayer. Jot’s aluminum frame has a durable powdercoat finish. The frame sits on four 360° rotating high-durability lockable black casters. For easy clean-up, two marker holders backed with felt erasers ship with each glassboard. Jot’s size accounts for the typical width/height span of working writability; this means you have complete and comfortable access from any position—whether you’re sitting, standing or somewhere in between. Full-rotation lockable casters provide seamless mobility and make it easy to move Jot around. They also keep the glassboards in place once their position is set. A key aspect of Jot’s design is its angled legs. Among other benefits, they make it easy to arrange Jot to suit each project’s needs—multiple boards oriented in matching or alternating positions afford numerous layout shapes and configurations. The angled legs also ensure smooth alignment between fixtures placed side-by-side, a simple detail that results in a truly mobile-friendly design: Jot glassboards can be combined or separated at will—no mechanical fasteners or add-on parts are required—simply unlock the casters and Jot’s ready to roll. Finally, the angled legs allow Jot to nest for compact, efficient storage. Jot’s Diamalite glass surfaces have their own advantages. They’re ultra-thin, so don’t add unnecessary bulk or weight to the product. They’re ultra-durable to withstand day-to-day use. They’re easy to clean and maintain. And they’re non-ghosting: what gets erased stays erased. Jot is a versatile choice for a wide range of applications. 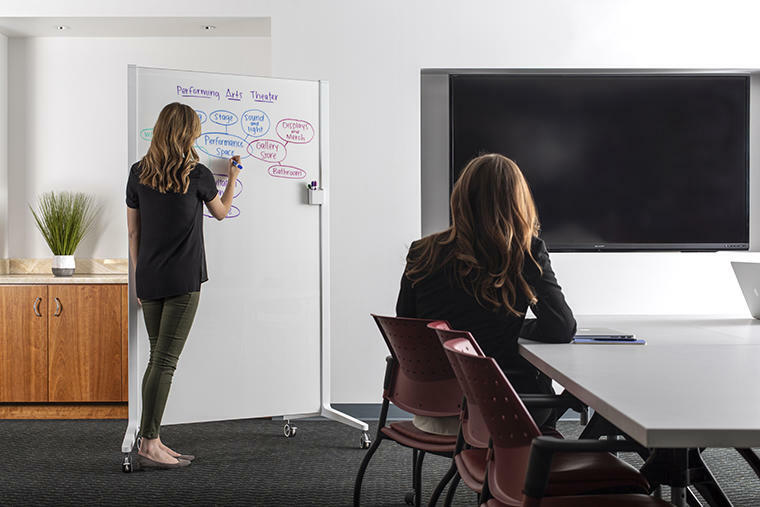 Whether you’re planning a new space, adapting an old one, or simply moving your meetings around, Jot is a great way to invite collaboration, define and re-define space, and create formal or impromptu work stations, huddle zones, project rooms, partitions, and more. Think Jot might be the right office partner for you? Learn more here.